For Marlene Create of Portugal Cove, the outdoors is her studio. Visual artist Marlene Creates can now add a Governor General's Award to her distinguished resumé. 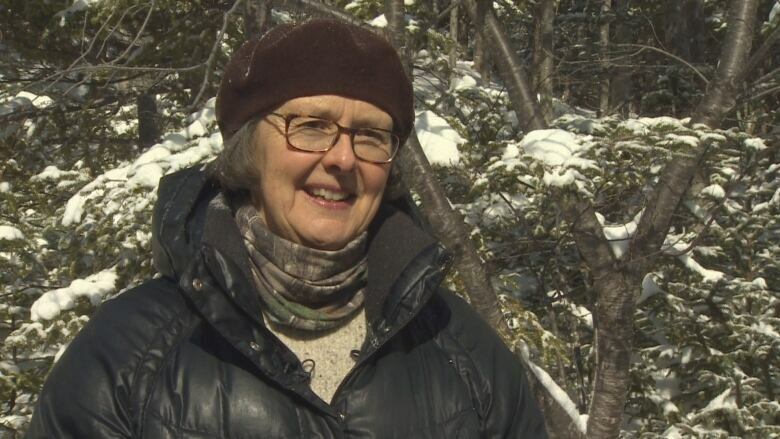 Creates, who has called Portugal Cove home since 1985, has presented her work around the world in more than 350 exhibitions and screenings, and was recently awarded a 2019 Governor General's Award in visual and media arts. She spoke with Here & Now's Carolyn Stokes about the award, in the same forested area that's been the subject of her work for nearly two decades. Here's their conversation, which has been edited for length. Can you describe what your work looks like? Well, since we're standing here in the patch of boreal forest where I've been working for 17 years now, what I've been doing is I've been just photographing my hand, my left hand, because I'm holding the camera with my right hand. I'm just photographing my hand on certain trees here in the forest. Now, there's thousands of trees here, so I could just go around any old day and just photograph my hand on any old trees but these are trees that I say I've individuated. I know them. I've noticed them for some reason from all the rest of the trees in the forest. When I first moved here, the whole forest was just a blur. I had no familiarity with it. But as the years go by I become familiar with more and more little parts of this terrain. It's a series called Larch, Spruce, Fir, Birch, Hand. 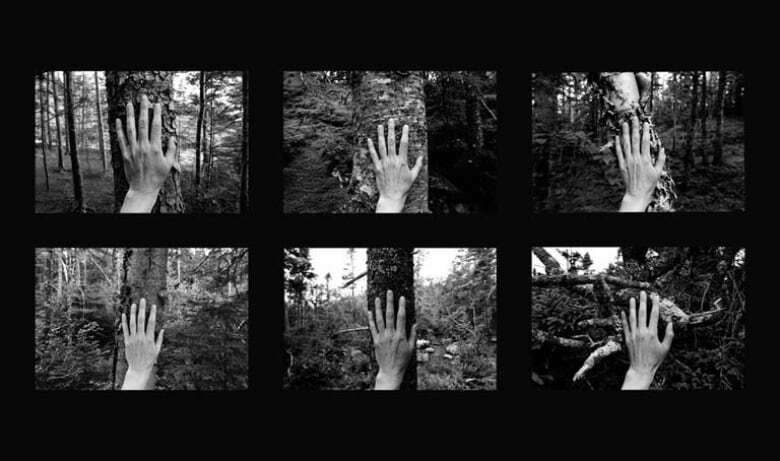 So you just simply see, in the black and white photographs, you just simply see my hand on the tree. But as the years go by, of course, my hand is aging. So that's sort of another interesting part of my way of proceeding is accepting the fact that things are constantly changing. What brought you to Newfoundland? Well, my mother's family is from Newfoundland, from Fogo Island. My great grandparents were born on Fogo Island and then my grandparents were born in Lewisporte, because the family sort of left Fogo Island and moved into Lewisporte, and I grew up not really knowing about my Newfoundland family history. So I came as an adult and I discovered that I just loved it here. Everything here has so much meaning to me. And what happens here matters to me and it's important to me. The rich culture here, and the rich natural environment, it just has been an abundant source for me for my for my artwork that I'm so grateful for. You came in 1985, so you've been here quite a long time now. And do you plan to stay? Oh yes, I don't have anywhere better to move to [laughs]. The Governor General award — is that for a body of work? Yes, for visual arts. It's quite different for literary arts and the Governor General's Awards for literary arts existed for several decades before they started giving awards for visual arts and performing arts. In literary arts, you if you receive a Governor General's Award it's for a particular book, a book of poetry, or a play, or a novel. In the visual arts and in performing arts, they consider it for lifetime artistic achievement. I'm working on terms in the Newfoundland dialect for the wind and local weather lore about the wind. I did a lot of work about terms of the Newfoundland dialect for ice and snow and winter weather, and there was a couple of videos that came out of that, as well as a book that Boulder Publications published called Brickle, Nish, and Knobbly. And I've since discovered that there's a lot of terms in the Newfoundland dialect for the wind, and a lot of weather lore about the wind. So I'm working on another video that will incorporate those those aspects of the wind. Our meteorologist, Ashley, will love that. Yeah, and it's all based on a beacon. I photographed a beacon on Middle Rock in the harbour in Joe Batt's Arm through four seasons. So the beacon is sort of like this one still point with all the water — well, of course, the way you see the wind is its effect on the water, right? So all the water and the waves and everything all moving around this one fixed, still beacon. So I have all the data of the wind direction and the wind speed at the time that I took each photograph, and ratings on the Beaufort Scale, which is a historical way of measuring wind speed for sailors, mostly because it's about the effects on the sea. So I have a huge amount of material which I'm trying to now compile and figure out how I'm going to use it in the video that I'm hoping to make with these images. So the outdoors is really your art studio? Yes, this is my studio. I'm not a studio artist, actually, and I discovered that in the late 1970s. I did have a studio. I thought as a young artist you're supposed to get a studio and you're supposed to make things. And I just decided to start working outside in a very temporary kind of way. It's a series called Paper, Stones and Water and I just would arrange paper in the landscape and let the wind and the weather have an effect on it and I'd photograph it and then take the paper away, because I didn't want to make any permanent change to the landscape. Once I started working outside the studio, then I found I could work anywhere. I could use the whole planet and all its weather systems and celestial overhead — it all became material that I could use for my work instead of just sort of sitting in a room and trying to imagine something. It's interesting how this award highlights you as an artist, but it is also really shining a spotlight on this province. I really really like that, because my work is really just about paying attention to something that's already there. I do feel that the award really largely is for Newfoundland and Labrador because it has provided me with the material for my artwork.